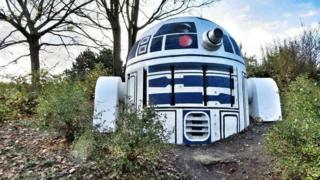 Image caption "That's no moon"
A group of unknown graffiti artists in Prague have transformed an unsightly air vent for a nuclear shelter into the Star Wars robot R2D2, it's reported. The vent is one of two in the Folimanka park in the Czech capital, and the work of the unknown artists appears to have gone unnoticed for anything up to a week, the Prague.TV news website reports. As well as painting the air shaft, the anonymous painters added two large pieces of concrete to create the droid's legs. A sign was found at the site asking people not to damage the work, but Prague.TV notes: "it's not an official city sign". The local authorities appear to not be overly displeased at the mysterious paint job. "We do not support illegal spray painting, but we like this decor on this unsightly shaft," Mayor Jana Cernochova told the Blesk web portal. "Where else should the robot be, than in the city district so associated with Karel Capek, the author of the term?" she asked. Ms Cernochova is referring to the Czech author who first coined the word "robot" in 1920 in his play Rossum's Universal Robots. The existence of the Folimanka shelter remained a state secret for years, but according to Prague.tv, it now opens once a month for visitors to witness a slice of Cold War history. There is some question over its longevity, the Idnes.cz website asks, noting that the site has already been taped off. This month has already seen the removal of the iconic giant fibreglass babies adorning Prague's TV tower. They're due to be returned next year after cleaning and repair.